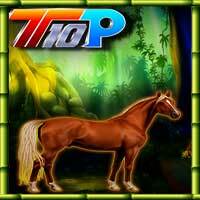 Top10 Save The Horse is another point & click escape game developed by Top10NewGames. In this game, you came to know that someone cursed a horse by a magical bond. You need to release the horse from this curse by finding useful objects, hints and by solving puzzles. Click on the objects to interact with and solve puzzles. Good luck and have fun!